The photos above are of my sturdy book cradle which has done me well for three years. I learned this construction from Mark Andersson. All you need is your thickest binders board and a small amount of pva. It is simple enough that I bet you'll get the gist of it, just by looking at the photos. I will, however, share a trick! The valley portion of many punching troughs is made with two pieces of board or wood. For this clever version the valley portion is made out of one piece of board that has first been scored (approx. 1/2 thickness of the board) with a knife and then folded away from the score line into the "V" shape. There will come a time when it seems you've punched a hole through every millimeter in that fold. 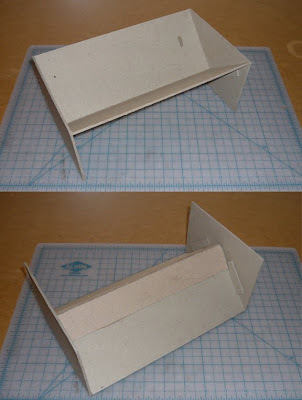 When that time comes, do as I've done in the bottom photo - cut another piece of board to the proper length, use the very same score & fold process, and glue it into place. Punch away! By the way, this post was prompted by two different threads on our group message board. One about punching holes, by Trace of It's all just Menagerie, and another that was started yesterday by Kristin Crane. Thanks for the prompt you two, and Happy Birthday, Kristin! While my binders board punching trough does the trick for me, there are some really beautiful wooden ones out there that might just meet your fancy! When reading the threads I mentioned, there were a lot of great suggestions made by fellow Bookbinding Team members, including the links below. You're right, the ones on Etsy are very desirable but I made mine, much the same as yours, about 20 years ago and it's still going strong.